In Dnipropetrovsk, a predominantly Russian-speaking industrial city, and Odessa, the predominantly Russian-speaking port city in southern Ukraine, several thousand people joined similar marches. There were demos in Kharkiv, Donetsk, Kherson and Zaporozhye – smaller than pro-Russian marches ... but shamefully downplayed by western media reports. Messages from activists in social movements in eastern Ukraine painted a grim picture. My friend G., a trade union activist based in Dniprodzerzhinsk, emailed to say: “Most ordinary people are cautious or hostile to the [Ukrainian] nationalists, and so Euromaidan got very meagre support here. There have been many rallies here against the accession to power [in Ukraine] of ‘fascists’ and ‘nationalists’. “But after Russia sent its forces into Crimea and threatened war – both sides appeared ready temporarily to drop their differences and defend Ukraine. The bottom line is that this conflict is starting to unite people. Those who openly support Russian intervention are not visible right now. A radical left activist, D. from Dnipropetrovsk, emailed in a more pessimistic vein, quoting Pushkin: “The people were silent.” [The famous last line of the poem Boris Godunov – GL.] “That applies to workers whether young or old”, he said. The events around the Maidan demonstrations had a polarising effect. “Wide layers were seized by nationalism, Ukrainian or Russian. [...] That’s a catastrophe that could be compared to August 1914 [the outbreak of the first world war]. In London, home to the largest community of Russian migrants in western Europe, an anti-war demonstration at the Russian embassy was followed by action at Trafalgar Square, where Boris Johnson was hosting a festival to mark Maslenitsa (the Russian equivalent of Shrove Tuesday). A banner saying “No invasions! Stop repressions!” was hung over the balcony of the square. The demo organisers were aiming at the event’s Russian corporate sponsors – as they put it, “the largest oil polluter, Rosneft; the union busters Aeroflot; the hate mongering Russian state media and Kazmunaigaz, which was responsible for massacring Kazakh oil workers”. Against what is Vladimir Putin directing this war? The story being told in the western media is that he seeks to undermine Ukraine’s new government – nationalist and right wing, with a neoliberal economist prime minister, and portfolios held mainly by members of Batkivshchina (Yulia Timoshenko’s right wing liberal party) and the extreme nationalist populists of Svoboda. I don’t think this coalition, thrown together in the crisis that followed Yanukovich’s departure, is his main target. Rather, it is the mass movement that accompanied the Maidan protests, which brought ordinary Ukrainians into political and social action on a level unprecedented since the break-up of the Soviet Union. Above all, Putin fears the spread of protest, and popular participation, into Russia. Last week I wrote (here) that “Russian support for separatism in eastern Ukraine, or even, in extremis, civil war” were not the most likely prospects. I was wrong. And now, although military action beyond Crimea is unlikely – or perhaps I mean “unthinkable” because the consequences would be so disastrous – it has to be acknowledged that Putin’s operation in Crimea could spin out of control. I agree with the statement by Open Left in Russia, that the Crimean operation can not solve Putin’s basic problems. His regime is not built on strong foundations. Russia is slipping back into recession, its economy able to maintain its footing only thanks to high international oil prices. In a discussion with British leftists about Ukraine yesterday, the opinion was voiced that “anti fascism”, meaning opposition to the new government in Ukraine, is the priority, and that it would be “no bad thing” if the Putin regime put arms in the hands of “anti fascist militia”. But there are no “anti fascist militia”. The European left should not use this crisis to indulge its own fantasies.Yes, we in Europe should do everything we can to help Ukrainian socialists and trade union organisations who have come under attack from right-wing nationalists and fascists. I argued for that in an article last week. But there is no question about where the greatest threat is coming from to working-class solidarity, to social movements, and to the attempts of people in Ukraine and Russia to shape their own future ... it comes from Putin’s militarism. Let’s support the anti-war movement and independent working-class and social movements in Ukraine and Russia however we can. GL. 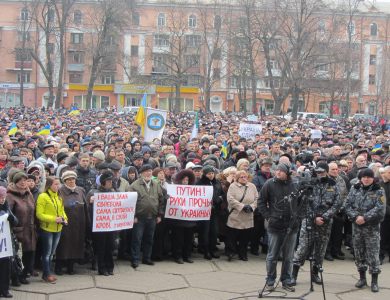 The photo shows a big demo in Nikolaev. The banner in front on the right, written in Russian, says "Putin, hands off Ukraine". ■ From People & Nature. ■ Read “The end of Yanukovich is a beginning”, posted last week. Mainstream media opiniomakers posting on Libcom...? “But after Russia sent its forces into Crimea and threatened war – both sides appeared ready temporarily to drop their differences and defend Ukraine. The bottom line is that this conflict is starting to unite people." So, all of a suden it's ok to pledge alliance with nazis, right? But perhaps the poster couldn't care less.